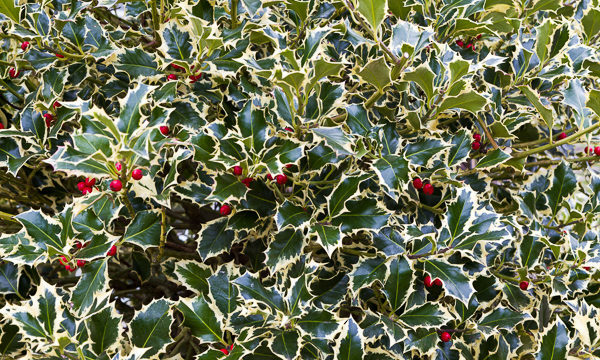 Evergreen plants are invaluable to give a garden some interest in the depths of winter. And small evergreens are particularly useful to grow near paths and deciduous shrubs or trees, filling gaps in the border until spring arrives. 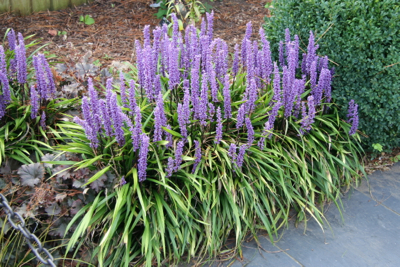 One of the most useful (and tough) little evergreen plants you can find is Liriope muscari (or ‘Turf Lily’). It’s a dark green sedge which forms neat little mounds of strappy leaves. 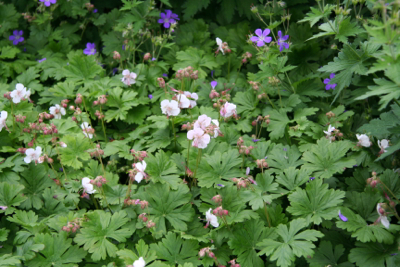 Great in shade (even dry shade) or sun (if in a moist soil), it flowers late in the summer which is another bonus. Most Liriope have violet flowers but there is also a white flowering variety called Liriope muscari ‘Monroe White’. 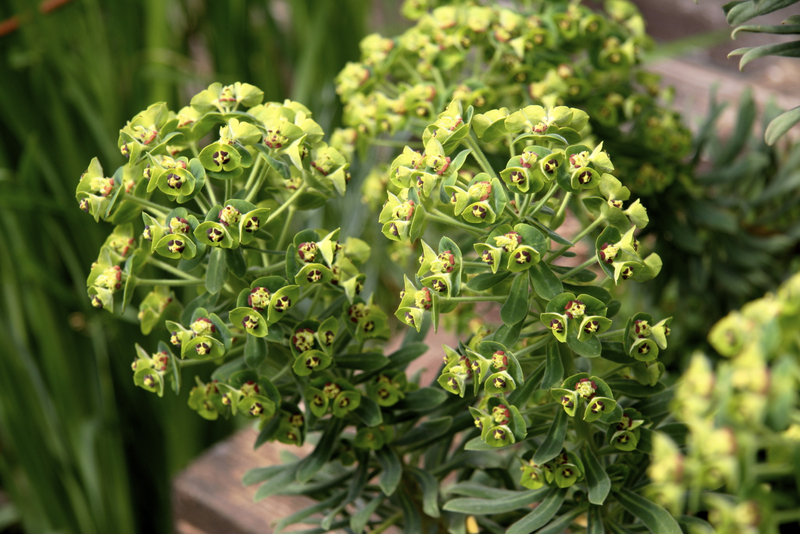 Height about 40cm (in flower) and spread maximum 45cm, and perfect for low-maintenance year-round planting schemes. Pittosporum tenuifolium ‘Golf Ball’ is, I think, a recent introduction to the UK, and I’m very excited about it! Pittosporums are great evergreen shrubs (with tiny scented flowers) but most varieties will reach around 3m x 2m in size over time. ‘Golf Ball’ is a smaller variety, naturally rounded (and easy to clip into shape) with beautiful fresh green leaves and contrasting dark stems. Average size about 1m round. 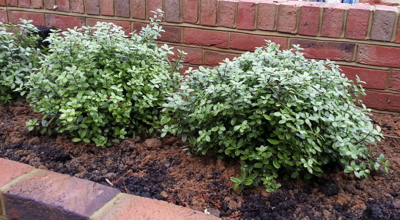 It’s very easy to grow as long as your soil is well-drained, but Pittosporums are not fully hardy, so plant with care. This is a lovely shrub to add shape and structure to a scheme in a sunny, or partly sunny, site (and ideal if you want to create a low hedge). Helleborus orientalis (also known as Helleborus x hybridus) are such popular winter-flowering plants, and it’s really not surprising. Not only are they small and well-behaved, but the flowers are very pretty and long-lasting, coming in a range of colours from white and pink to red. 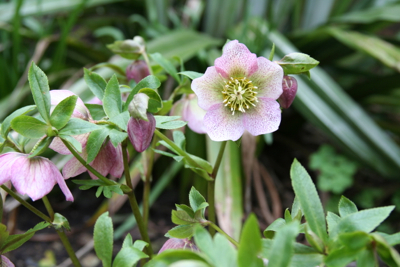 These hellebores are also known as ‘Lenten roses’ which is a very suitable name, given the shape of their flowers and the fact that they generally bloom between February and April (although in mild winters they may flower earlier). 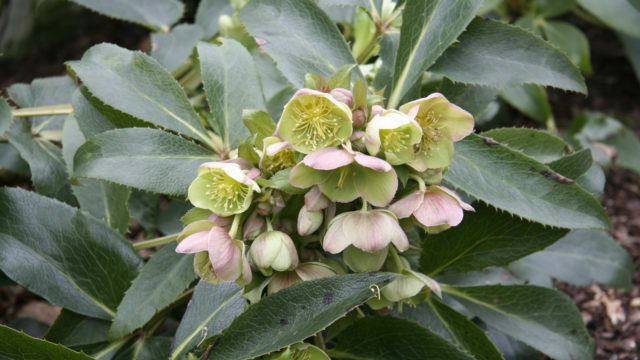 As the flowering stalks emerge at the base of the plant the dark green leathery leaves drop to the ground, and should be cut off at this point as new leaves will also soon appear. Cutting back the old foliage also allows for the upright flowers to be seen at their best (although I suppose this technically means that are not evergreen in the true sense of the word, but new leaves grow quickly!). Average height and spread is about 45cm, and they do prefer a good soil (neutral to alkaline) with some shade. 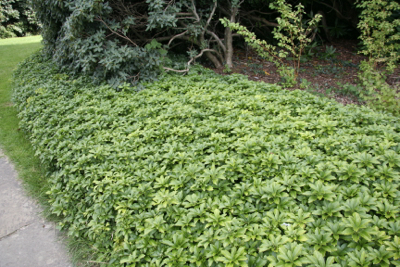 Pachysandra terminalis is a low growing evergreen with rosettes of serrated glossy leaves, commonly known as ‘Japanese spurge’. It spreads slowly but will eventually cover quite a wide area (up to 1.5m) with dense growth about 20cm high. This makes it an ideal ground cover plant. 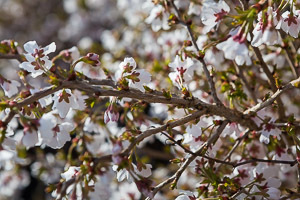 As it’s happy in sun or shade, and tolerant of most soils it’s a seriously useful addition to the garden (especially for carpeting the ground under trees and shrubs). In late spring there’s the added bonus of clusters of small white flowers, but it’s mainly grown for its foliage interest. I love Euphorbias! They have such a zingy acid yellow-green flower which is always a welcome sign in spring. 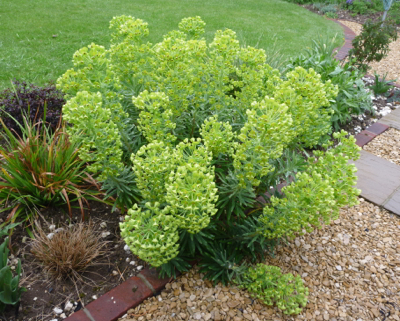 There are many varieties of Euphorbia characias and Humpty Dumpty is one of the more well-behaved varieties I have come across. It’s quite a neat plant compared to many, not getting much wider than about 60cm across (maximum height about 1m). It’s a sun lover (though will cope with a little bit of shade) and needs well-drained soil to really thrive. Once the old flowering stems have been cut down to the ground, the new stems grow to replace them, forming a neat mound of unusual glaucous leaves which last through the winter until they flower the following spring. This Euphorbia turned up unexpectedly in a raised bed in my garden. I have no idea what variety it is but it’s a lovely plant! In my experience Euphorbia characias varieties do tend to move around the garden and pop up in the most unexpected of places, so they aren’t the most reliable plant if you need them to stay put. I love to plant Euphorbias with purple alliums, Salvias and blue geraniums, lavender and nepeta. It’s a match made in heaven!